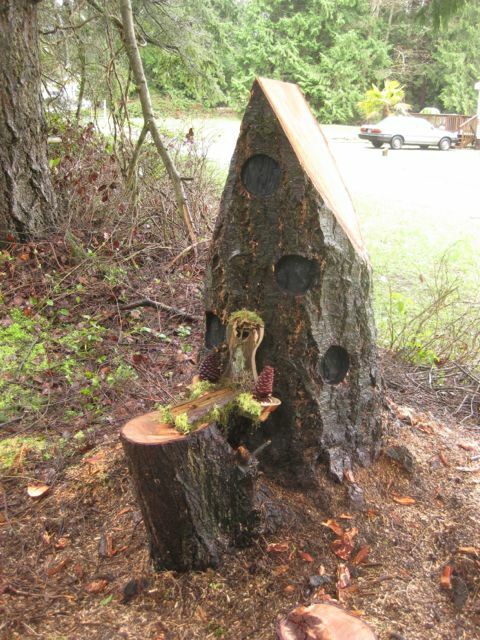 Each Gnome Home has its own personality and requires just the right old tree log to bring it to a new life. 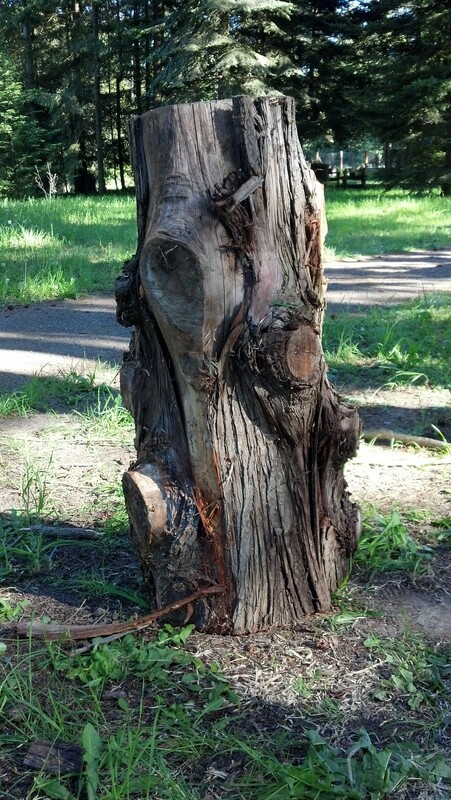 I searched a number of my sources and found the perfect log in an old stump pile at a nearby mill. The new gnome home-to-be is the top log in the pile. Even on its side, you can see the whimsical potential. 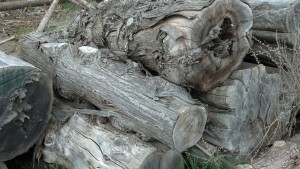 So with the help of a big tractor and my truck, the log came back to our log yard for construction. Standing at that time over 5’ and weighing a lot, I then began to visualize the locations of the windows and doors. By looking at the photo, you can see there are many options. Next was to select the front view and cut the roof line. I only get one chance at getting it right on this cut. Good sharp saw blade and trust it comes out evenly. It did, and the personality started to come out. From there, I cut it down to 4’ and began the carving of the windows and doors. I did use the many sticks and branches the customers provided. I also added my own, which we collect from our beach and coastal travels. This process can take days to a week. A little work, walk away, and come back again while changing and adding more features. 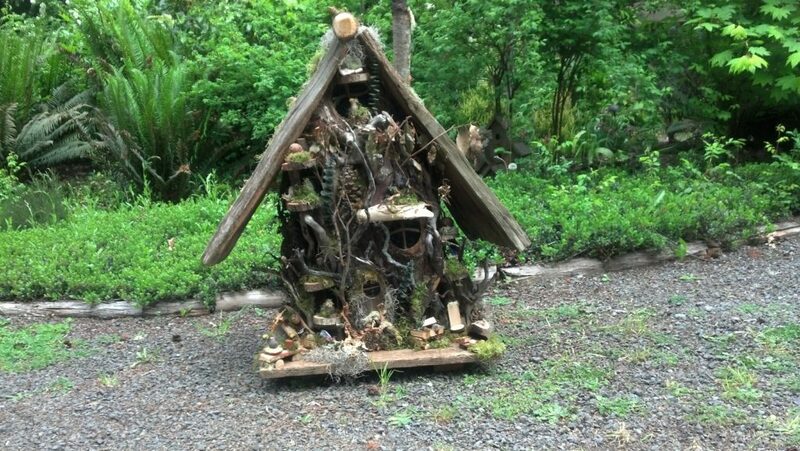 At some point, it is enough and the gnome home look is achieved. The final assembly is the addition of the roof, chimney and ridge top. This roof was made out of very old, large cedar shakes I found out in Joyce, WA, from a very old shack that was being removed. Construction complete, small outdoor furniture was made and added. Window decorations and moss completed the project. 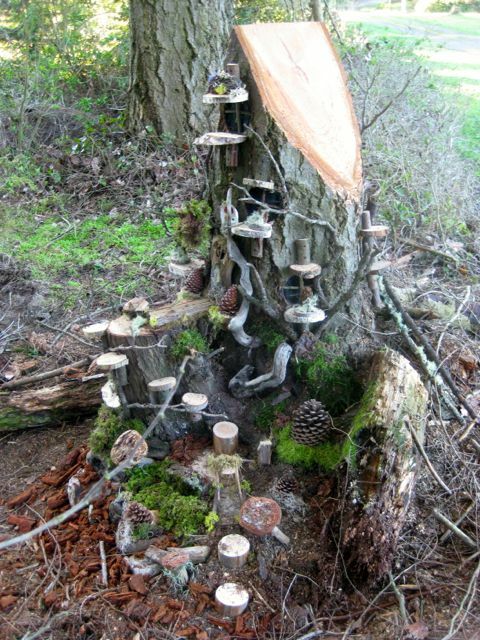 It then became a true, woody, Whimsical Woods Gnome Home. 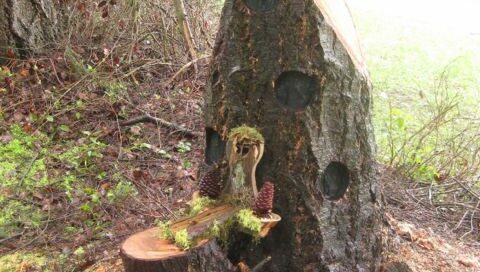 A great custom project that, with the “just right” log, turned out perfectly. 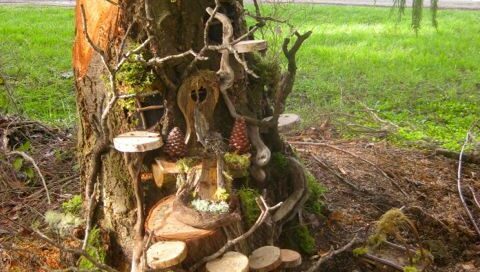 Now the gnomes will find it and all will be blessed with happiness and good will. 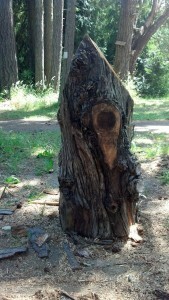 I’m working on incorporating the little stump in front into a porch entryway and may build a fireplace on it. Plan to add circular steps up to the porch from the ground. We’ll see how that turns out. It has been raining too much in the last few days to push ahead. Keep checking back for further updates. 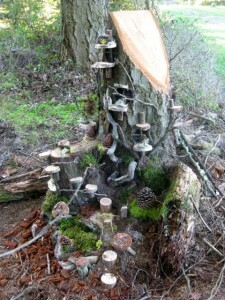 All in fun here at Whimsical Woods. 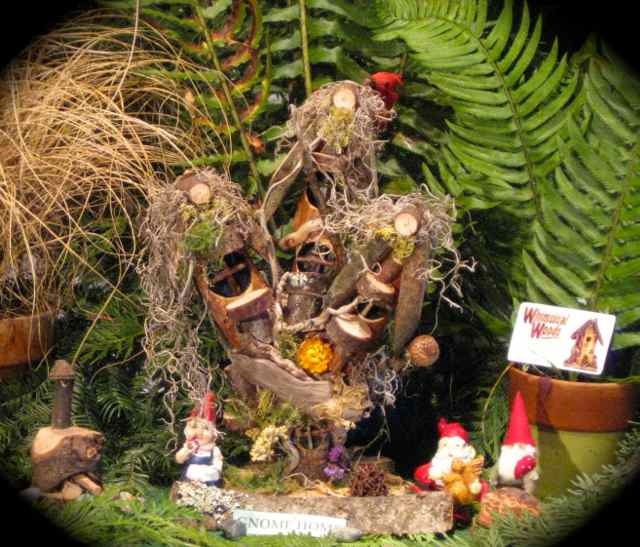 One of a kind, very whimsical gnome homes for your indoor or patio setting. 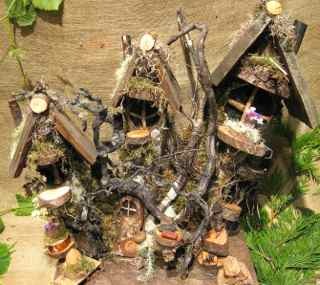 Gnomes love a little whimsy in their lives and the Collectors Choice style will add that very unique gnome home for all to enjoy. 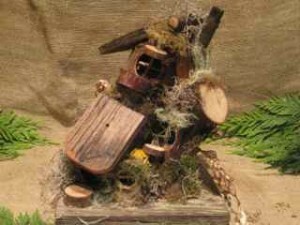 Build a little scene on a table top and place house plants around it to set the scene and trigger one’s imagination. What you’ll end up with is a table top work of art! 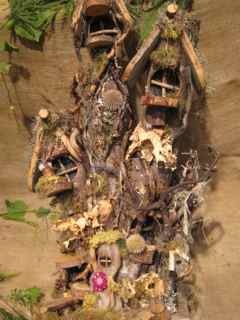 These special Collectors Choice Gnome Homes are available for viewing in our studio and at the various arts and craft shows we will be attending in Washington State. Since these are one of a kind, they are not available on our website. 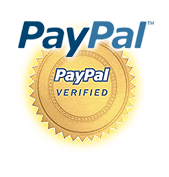 But if you see one here you would like, please contact us to see if it is still available. 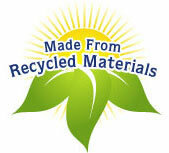 We would also be happy to send you photos of what is on hand and we can then ship it out to you. Have some fun – smiles will follow! All you need is an ordinary tree trunk and our gnome door and windows, and they will immediately add a bit of whimsy to the tree causing smiles and curiosity to all who see it. A big hit for the grand kids, for sure! They are 100% recycled, old fence board and cedar shakes. That’s the beauty of them. Like our other Whimsical Woods products, no two are exactly the same. 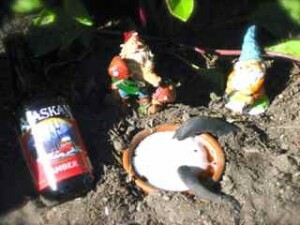 I have a few locals who have placed theirs indoors on the floor next to their fireplace for the house gnomes. One gentleman said his cat lies in front of the door waiting for the gnome to come out. I’d love a picture of that! These doors and windows are on our website (http://whimsicalwoods.net) for shipment throughout the country. They make an excellent simple gift that will surely bring smiles to someone special. Enjoy! 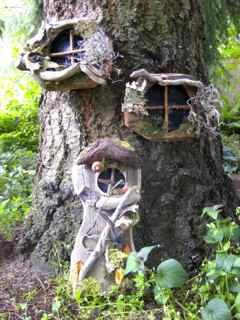 I am always looking for new, imaginative gnome homes to tweak imaginations and bring smiles to many faces. The Collectors Edition is a new use of old and very oddly shaped pieces of logs that can be sculptured into a very different style of gnome home. These are a lot of fun for me to make. 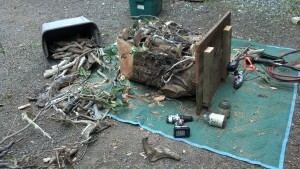 I start with firewood (before it hits the burn pile) and take it from there. 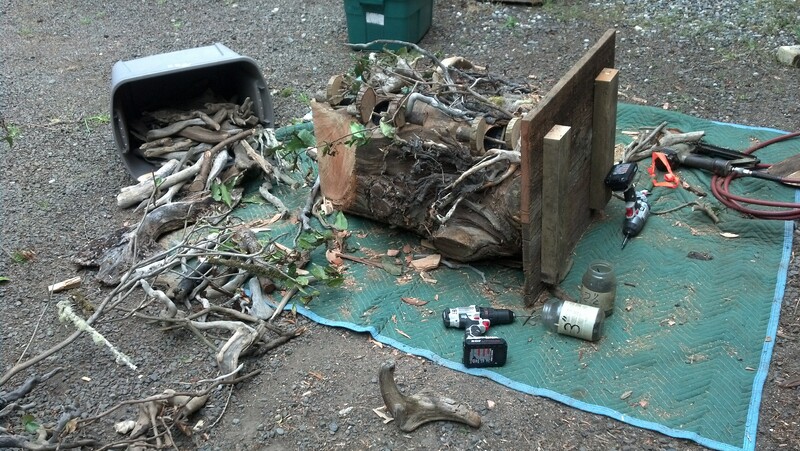 These were destined for a fireplace, but now will be a special gnome home! Placing them outside is okay, but likely to get lost in their surroundings. In my opinion, best to locate them inside and put it where you and others can view it up close. It will surely attract attention and smiles. These Collectors Choice Gnome Homes are not available on our website as they are all one of a kind. We’ll have them at our various art shows in Washington and our local Sequim Farmer’s Market. 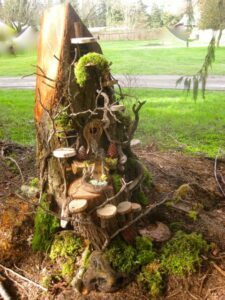 If visiting the area, call us (360-452-7308) and arrange a time to come by our Whimsical Woods to select the Gnome Home just right for you. Shown here are a few examples of our Collectors Choice Gnome Homes. We have many to choose from. All in fun, all is well.